Diving on the site of the HMS Erebus shipwreck will resume this month in the high Arctic. Sir John Franklin’s ill fated voyage to find the northwest passage came to an end nearly 170 years ago as the Erebus was trapped in ice for two years off Prince William Island in Queen Maude Gulf near Nunavut. 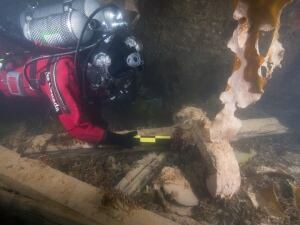 A Parks Canada diver measures part of the Franklin expedition’s Erebus on Sept 18, 2014. Thierry Boyer/Parks Canada photo. 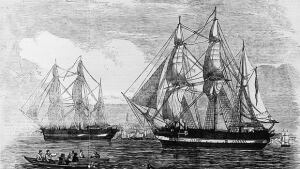 Franklin’s 1846 expedition had two ships; the HMS Erebus and HMS Terror. No sign of either has been evident for nearly a century and a half. Seven months ago the Erebus was discovered by a group of private-public searchers lead by Parc’s Canada. Now the next chapter is unfolding. HMS Erebus and HMS Terror, shown in the Illustrated London News published on May 24, 1845, left England that year under the command of Sir John Franklin and in the search of the Northwest Passage. Courtesy London News/Getty Images. The irony of this continued expedition and salvage project is that the divers will be descending through two meters of ice to reach the bottom of the gulf. The same ice was responsible for crushing the wooden ship and sending it to the ocean floor a century and a half ago. The benefit here will be that the thick six foot layer of ice will eliminate surface waves and almost all water movement around the wreck therefore keeping any sediment and particulate from clouding the water. Clear visibility will enhance the efficiency of the divers time in the -2 C icy water. These clear conditions will be most beneficial for the operation of the new 3D laser scanning apparatus archeologists will utilize to produce incredibly detailed images of the Erebus lying 11 meters below the surface. The main goal for this expedition is to create a comprehensive baseline recording or map of the wreck site before continuing on with possible salvage work. Current dive site plans call for 14-hour dive days from 8 AM- 10 PM over a 10 day period. Divers outfitted with specialized dry suits will be able to dive for over an hour at a time. Two-person dive teams comprised of one Parcs Canada member and one navy member will be deployed in steady succession. Aside from mapping the site, crews will also try to gain valuable insight by probing an extension camera into nooks and holes in the Erebus to get an inside look into the past. Churchill has been the focus of countless exploratory expeditions from Europe over the centuries and now a discovery that has captivated the world has also touched this remote outpost on the Hudson Bay. The Anglican church in Churchill is home to a gift from Sir John Franklin’s widow in appreciation of all the efforts from countless men in searching for her husbands lost expedition throughout the north. It appears now that this ancient mystery has been solved. Lady Franklin stained glass window. Karen Walker photo. Come to Churchill and see the Franklin stained glass window and the the mighty polar bear! Natural Habitat guide Elise’s group headed to the tundra on a morning that was a bit breezy but slowly calmed throughout the day..”As the tundra turns the bears actually shook off their hypnotic-like state and started dancing.” Elise stated. The majority of the day was time out around the lodge. Two polar bears slumbered in the willows near the bay while two other bears cautiously investigated the underside of the lodge once the water delivery vehicle departed for the day. “The stars aligned and two bears started sparring on the other side of the lodge”. reported Elise. Three large polar bears then staked out an area by the south end of the lodge and gave quite a show for onlooking travelers in both Elise’s and fellow Natural Habitat guide Paul Brown’s Rover. Another bear dozed, seemingly unaware beneath the lodge’s propane tanks the entire time..probably the older bear who’s been idle and present for the majority of the last two weeks..
Out around Christmas Lake Esker, the group observed numerous trails of fox and ptarmigan area…followed by a flock of “cryptic ptarmigan” concealed in the willows by fresh snow. Guide Karen Walker’s group had some tough luck with the wind kicking up to nearly 70 knots. Helicopter journey’s were cancelled and a bear lift out at the compound was also nixed. The group listenedto some northern stories from their driver and then toured the town complex….Churchill’s self contained recreation center and library, school and many other forms of activity all in one building. Watching the waves crash down on the bay from the panoramic windows was soothing and relaxing. Then it was off to the Anglican Church to see the lady Franklin stained glass window aside the altar. The travelers then braved the windy, snowy conditions and ventured down to the Inukshuk below the complex and out to the polar bear compound by the airport in whiteout weather. Tundra around Churchill. Megan Koelemay Photo. Later in the day Karen and group enjoyed dog sledding with Kelly at Churchill River Mushing and heard the details of the polar bear break in at his tent compound the previous week. The rides were chilly though the wind had subsided some and the shelter from the boreal forest Luckily both places were vacant at the time. This weeks incident in town didn’t have as fortunate of an outcome. The bears are restless and moving with the cold. Dogsledding in Churchill with Kelly Turcotte. John and Becky McKay photo. The following day out in the Churchill Wildlife Management Area Karen and travelers were greeted by a large male bear walking right by their rover as they headed out east. Several polar bear sightings later they were at the coast and two adolescent males were sleeping along the kelp beds. One awoke, picked a fight with the other, and the two bears sparred for a good time just 50 feet from the rover. They then returned to their slumber and sparred again later just inside the willow stands a bit farther out. At lunch another male joined the trio and spareed intermittently just off the back observation deck. A “three bear lunch”, as described by karen. The “best and closest sparring I have ever seen”, added Karen. Two separate excellent viewings of ptarmigan along the trail as well as a lone snow bunting in the willows rounded out the excursion. A fantastic tundra experience in the CWMA!